Overall: Thank you for a great fundraiser party last weekend! The spring melt/freeze cycle is dominating our scene and snowpack temperatures near treeline are nearly isothermal, but below 0°F. There is a small chance for snow showers in the forecast. In the off chance that we get significant accumulations, watch for new storm/wind slab development, primarily near and above treeline. Natural and human triggered avalanches are unlikely near and above treeline during the early mornings. As the day heats up, natural and human triggered avalanches will be possible on southern aspects and any slope receiving strong solar input or consistent temperatures above freezing. Below treeline, wet avalanches may be possible on steep (>30°) isolated slopes where the snowpack has become saturated by a combination of sunshine and above freezing overnight temperatures. No new precipitation since March 22nd. No significant slab avalanches or unstable snow reported since February. Small loose wet avalanches were observed recently. Read more about springtime backcountry strategies. Read more about spring travel strategies. 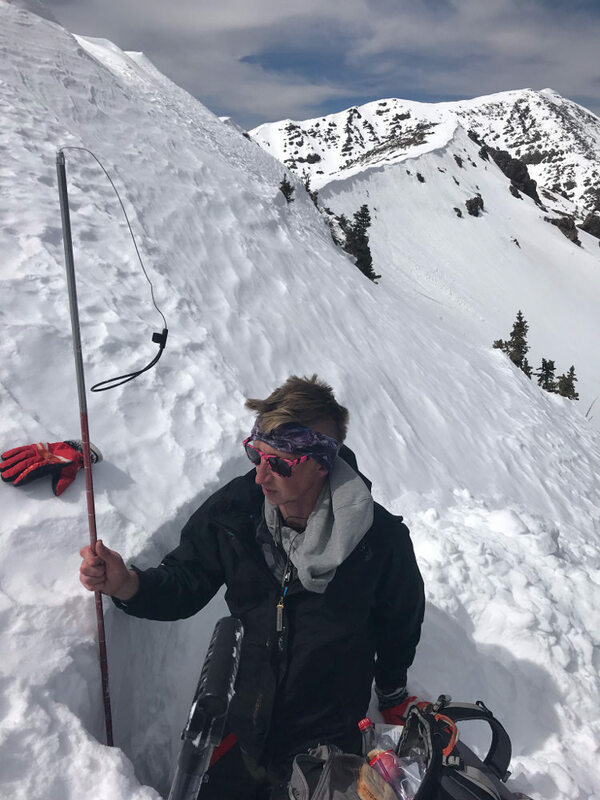 Near and Above Treeline:As the day heats up, natural and human triggered avalanches will be possible on southern aspects and any slope receiving strong solar input or slopes which have not frozen overnight. Expect to find wind scoured zones and hard icy snow above treeline. Crampons and ice axes will help prevent falls on steep icy slopes. Slush conditions are indicative of a saturated snowpack, which can slide unpredictably. 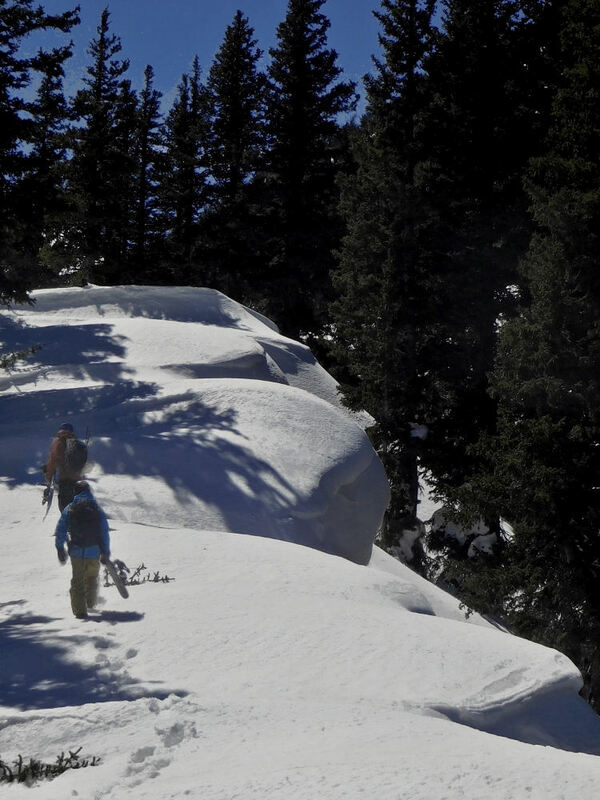 Wet avalanches may be possible on steeper isolated slopes where the snowpack has become saturated by a combination of sunshine and above freezing overnight temperatures. Watch for saturated, and deep slushy snow around terrain traps and any slope above 30 degrees. Evidence of loose wet avalanches were observed recently on east-southeast slopes near treeline. As the day heats up, watch for loose wet and larger wet slab avalanche potential - primarily above ~10,500'. Watch out for above freezing overnight temperatures leading to saturated and unstable snow on any steep aspect below ~10'500. Cornices have formed along ridgelines and cross loaded features. Stay away from the edges of tall and/or overhung cornices, as these may collapse unexpectedly and break further back than you may expect. See photo below. Cornices on the ridge between Abineau and Rees peaks. March 29th photo by Troy Marino. April 4th in Snowslide Canyon Bowl. Photo by David Lovejoy. Over the past week we have seen mild to cool nights, warm days, partly cloudy skies and windy afternoons. A series of cold fronts have passed to our north, producing sporadic snow flurries with no measurable accumulation. Overall, warm daytime temperatures have taken most of the thermal gradient out of the snowpack, even at high elevations. The snowpack is approaching an isothermal state in which all temperatures are close to the freezing point or at least close to uniform, top to bottom. Last week’s conditions are expected to continue, with another front passing to our north on Friday, and then warm high pressure building during the early workweek. The seasonal shift seems to be sending most storms northward, leaving us with some high and mid level clouds and our typical springtime winds. An illustration of this will be on Tuesday and Wednesday April 9 and 10, when gusts of 40-50 mph are foretasted. Temperatures during the early upcoming week may rise to the highest we have had so far this spring. On Thursday, April 4 the Inner Basin SNOTEL site (Snowslide) reported a snow depth of 54” (137 cm) at 9,730 feet. Arizona Snowbowl reported a settled base of 96” (244 cm) at 10,800 feet. So far this winter, 327" (831 cm) of snow has fallen at the mid-mountain study site. Since March 29, SNOTEL temperatures have ranged between 14°F on March 30, and 50°F on April 1. At ASBTP (11,555'), temperatures reported over the last week were between 18°F on March 30, and 44°F on April 1.